today y2uk came and brought some stuff i ordered at eBay. since it saves a lot of post and package costs, and y2uk didn't mind to bring the stuff here it was delivered to his german address. 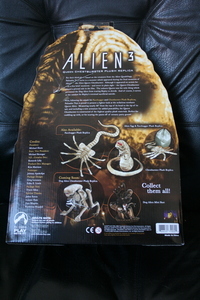 yeah, so i got some more alien-stuff for my collection. one from halcyon, hand coloured (the one shown on the left picture), and another item from kenner, now called hasbro, i could not really identify by now (the one shown on the right picture). the only picture i found on the net is located here. besides that i got two more volumes of makoto kobayashi's comic "what's michael?". so i have volume one to four. i think that's all translated comics available by the time of writing. if you have a cat, get these comics. you'll find your cat described on every single page of these books. 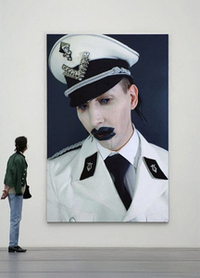 as i had concerns about copyright issues, since helnwein's picture was really taking up a lot of space on my picture, and at least i should and wanted give him credits, i sent an email to the address listed on the artist's website. a few days later i got a reply. it was written by g. helnwein's assistant named lorie. she said mr. helnwein gave his permission to publish this picture on the internet, but they would also like to have permission to put my photograph on their website too. wtf? permission to put my photograph on their website? i replied that it would be a great honour and pleasure for me if they would do so. and, well... they did so! take a look here. yahoooo! 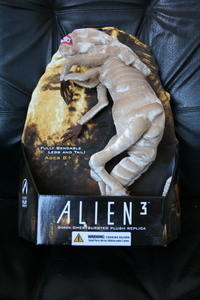 today my little plush chestburster which i purchased by an eBay auction arrived. the replica is even bigger than i thought. it says "life-sized" - wow. actually if a being of this size was inside my ribcage my lungs would be compressed that much, that i would suffocate. or my heart would stop beating. but hey, it's just a film! even the third part of a quadrology, where the alien-queen chestburster appears for the first time (besides the dog-chestburster). oh yes. i've seen it. i've been looking at it. i've been staring at it. i've been glaring at it. and i've been gazing at it. i was standing right in front of it. i was close to it. so close, i could almost touch it. i was as close as possible to it. and i've examined it. for minutes. and i enjoyed every single second. i've been surveying it from every possible angle. from top to bottom, from the front to the rear side, from the left to the right side. i admit, i almost drooled. i admit, i almost forgot about my environment. my eyes were fixated on it, and i admired it. the prop. the film prop. 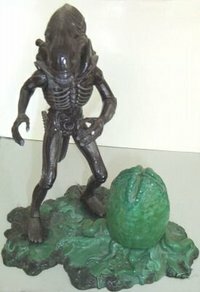 the film prop of alien 1. the original head of the ALIEN! unfortunately the years have afflicted it. but still one could see the wires and cables that were used to move the lips, the mouth, and the jaws. the coating was totally removed, either intentionally or because of decay - i don't know. it was pretty impressive (as one might guess from my words before). 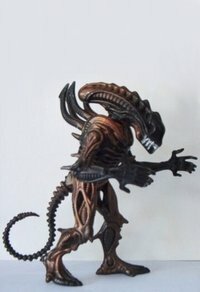 you can have a look at it yourself at the h.r.giger exhibition in the kunsthaus in vienna. loads of famous paintings are there. i was surprised of the seize some of the images have. again pretty impressive. oh, and you can also have a closer look at the harkonnen furniture. cool chairs actually, i had the honour to sit in one back in the 1980's, when i was on vacation via interrail and stayed a few days in zuerich. in chur there is the famous giger-bar where i drank a cafe. really nice cafe and nice inventory they have there. oh, and when i was in zuerich, i opened up the telephon-book, looked for "giger" and found his number. so i called there, if i could have a look at his garden, which i knew from television reports. unfortunately h.r.giger himself was not in zuerich at this time as his secretary told me, but i could have a look whenever i'd like to. that was really cool! unfortunately back in those days digital cameras were not affordable (maybe they even weren't produced yet - i don't know), but i have taken some analogue pictures, which i'm too lazy to scan right now. all in all i can really recommend this exhibition.